It had been 2 years since I had done a long ride of any kind and had been three years since I had been riding outside the country and even though I hadn’t got that much training done through too much work, moving house, moving my mum and everything else that had been going on, I still wanted to try and get a big ride done this year and not go another year without one. 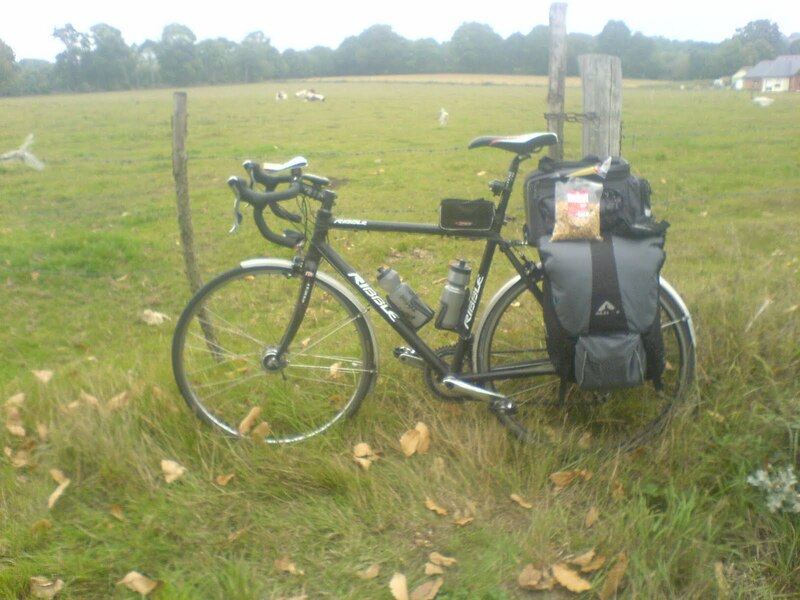 I hadn’t done France and it seemed fairly obvious as it was easy to get to and I didn’t have to deal with packing the bike up on a plane, which was never a great experience. I had been so busy with one thing and another that I hadn’t even got aroudn to fixing the lights on the bike, I had a built in dynamo on the front hub which powered front and back lights, I hoped I wouldn’t need to use it much but it was good to have, I also had a USB charger that Pete had bought me that was powered by the dynamo and would, in theory, power anything that had a USB connector. When I had gone with Pete on a 200 mile ride my computer had died at about 160 and it would at least stop that from happening, well as long as I wasn’t in darkness as I could only have one thing working at a time, lights or charger. After getting everything working again and with a brand new cable to the brand new rear light a quick trip into town for food and a fruitless french road atlas search (I could have bought one for Australia but not France??) I managed to set off at around 16:30 to hopefully get into Portsmouth at around 21:30. 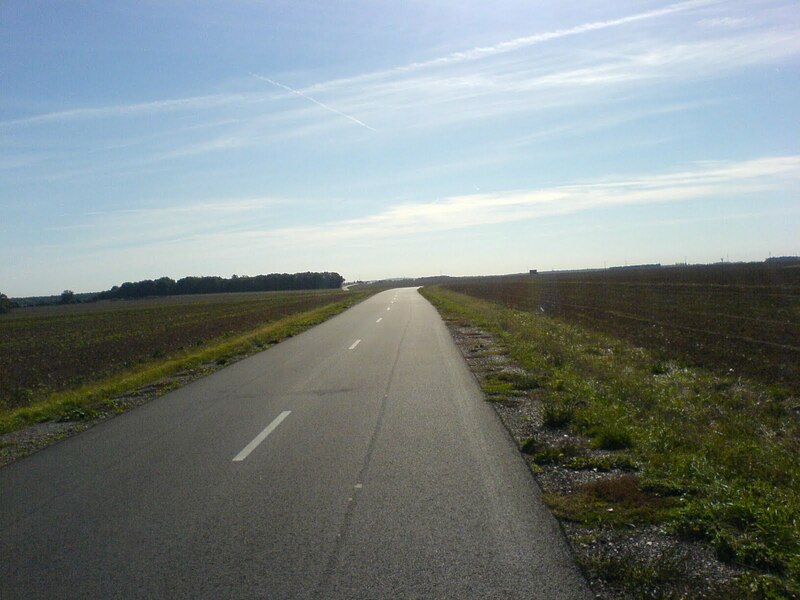 The ride down to the port wasn’t too bad, I was going ok and the weather was nice, the road was rolling through some nice countryside. I got to Portsmouth in good time, using my bright dynamo powered lights to see the way. I managed to avoid the drunks on the roads as well as a couple of fights and surprisingly didn’t get shouted at. I had got lost on the way to Portsmouth but only slightly but when I got the city I just couldn’t find the way to the ferry without using the motorway. I am sure anyone that has done some cycling has had that problem. In the end I cycled all the way through the city in a massive loop to get to the ferry from the opposite direction. I had arrived with 30mins to spare and rolled onto the ferry looking forward to my luxury comfy seat. I had assumed that there would be a communal shower to use for the people using the seats, appratnly I had assumed wrongly. Tired I got chnaged in the toilet, washed my face, had a quick beer (I was on holiday afterall and I was surprised how cheap it was – £2.60) and sank into the reclining seat. 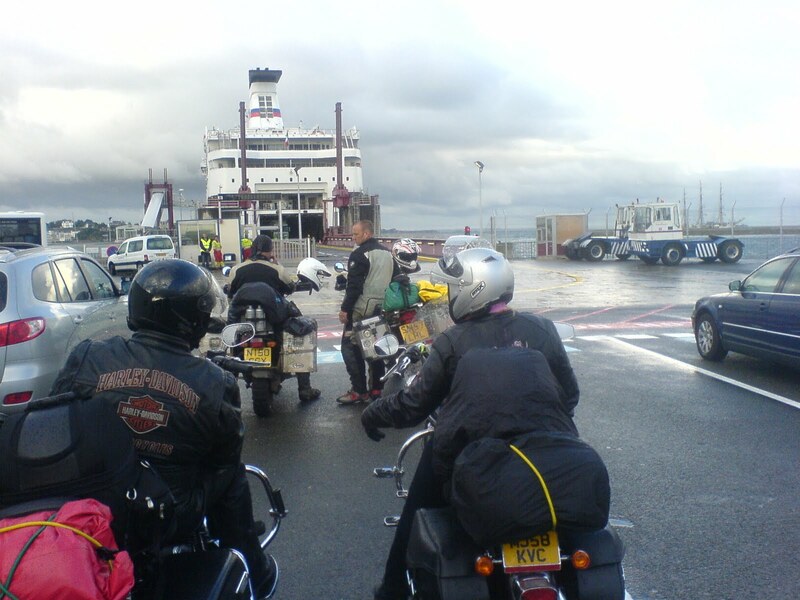 Rushed breakfast of bacon eggs and toast on the ferry as had only got an hour to get up and down to the bike, still no map as the shop on the ferry was very poor. Ready and set off in a nice crisp morning, finally found the way out of Le Harve after a ride through the industrial area near the port. 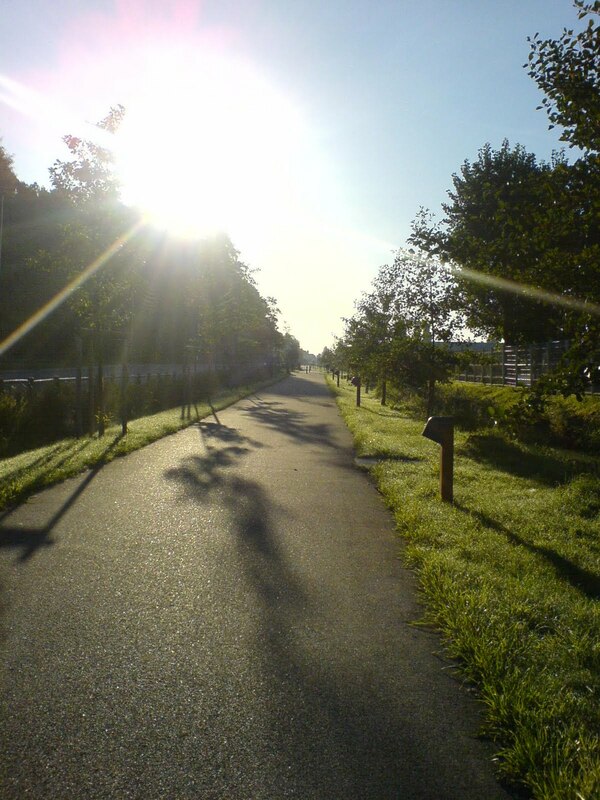 Found a nice bike path and followed that along, not really sure which was the best direction to go inbut seemed to be heading in roughtly the right direction. Not long into the first day when I got my first puncture. Tried to call Pete twice but no answer, also tried Steve but wouldnt go through. Carried on and finally picked up the signs to Evreux, where I knew there was a F1 hotel. Followed the main road, busy and one point there was a car turning left and cars queing when I heard screeching behind me and thought it was going to end in tears, the women in the car gave me a nice wave and I waited for her to get clear, waving back as she got back on the road. Generally the drivers had been very good and had given me plenty of clearance. I was struggling to find anywhere open, I found an Intermarche 5 mins too late as it was just closing, Sundays the shops are generally only open for a couple of hours in the morning. I finally found a service station at around 16:30 where I got more water and some snacks, the weather had been pretty hot and I was drinking a lot. My fitness, or lack of it, was showing and I was really struggling in the afternoon, my legs were really hurting from all the work they were having to do even though the route was fairly flat. I just hoped that I would pik up a biit tomorrow. 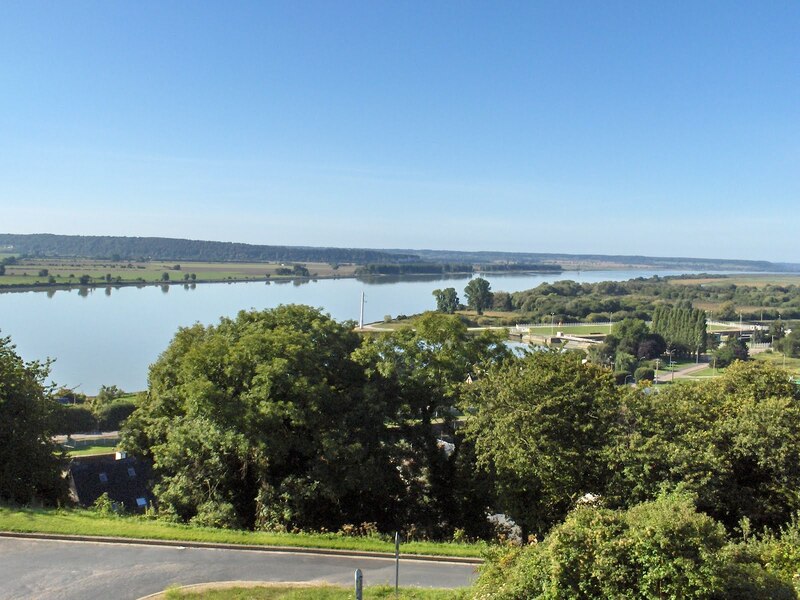 I rolled into Evreux at around 18:30, tired but glad to have found somewhere with an F1, I did have to stop and get my laptop out and check the PDF of the F1 brouchure to find directions to it. I was already glad I brought it even though it added weight to my bags. The F1 was as expected, cheap but clean and I made sure I paid for the breakfast after Pete had said he regretted not going for it when he had stayed in one. Woke up early, I had slept ok and got to breakfast fairly early. I had forgotten how long it took me to get sorted out in the morning and get everything back into the bags after it had exploded across the room. After getting it all sorted out I was away again, first thing was to get to Carrefour and get some food and most importantly a road atlas. There were no “light weight” versions so I had to get a full book. I felt guilty about immediately ripping the pages out I would need for the day but I wasn’t going to keep stopping and pulling the whole book out to have a look every time I needed to check the route. As usual the day was a little chilly to start off but soon warmed up and I had to put on another lot of sun cream at lunchtime. The days riding went a lot better with regards to the route but I was really struggling by the afternoon. 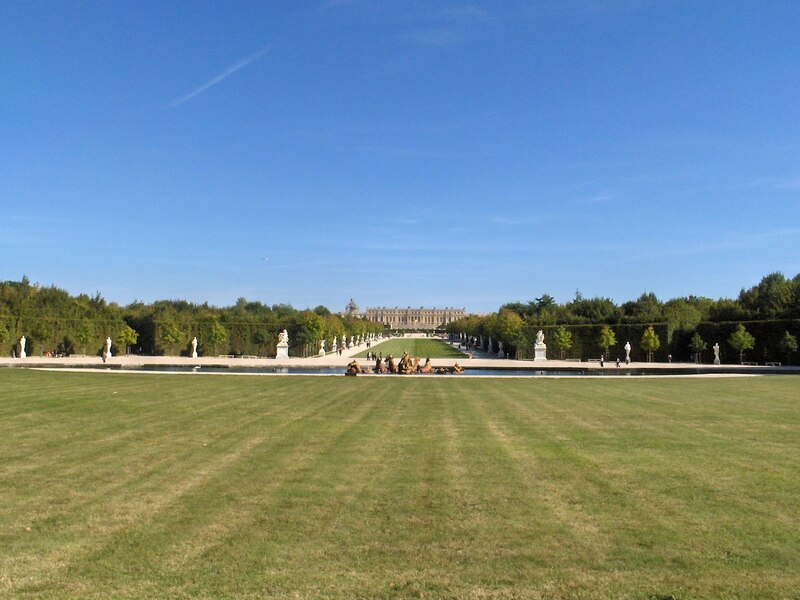 I found myself cycling past the Palace of Versailles and had to drop into the grounds to have a quick look. I was stunned at the size of the thing, it’s enormous, the “drive way” itself would take a long time to walk. I couldn’t really get close as the French government had positioned an old man to say “non” to me even when I was just pushing my bike, there were bike stands but I wasn’t going to lug my stuff around at that time of day just to have a look at the outside of the palace, especially when I had a few miles to go still. I finally got into Paris and found the F1 hotel at about 18:30, but it was full. I tried 6 more hotels before I found a little non chain one that had a room, the price wasn’t too bad either for Paris, at 50 Euros. I ate there too and afterwards headed to the Eiffel Tower as by then it was about 21:30 and I doubted I would be able to see anything in the morning as I had another 80 miles to do and my legs were really aching, especially my right which was causing me a lot of grief. 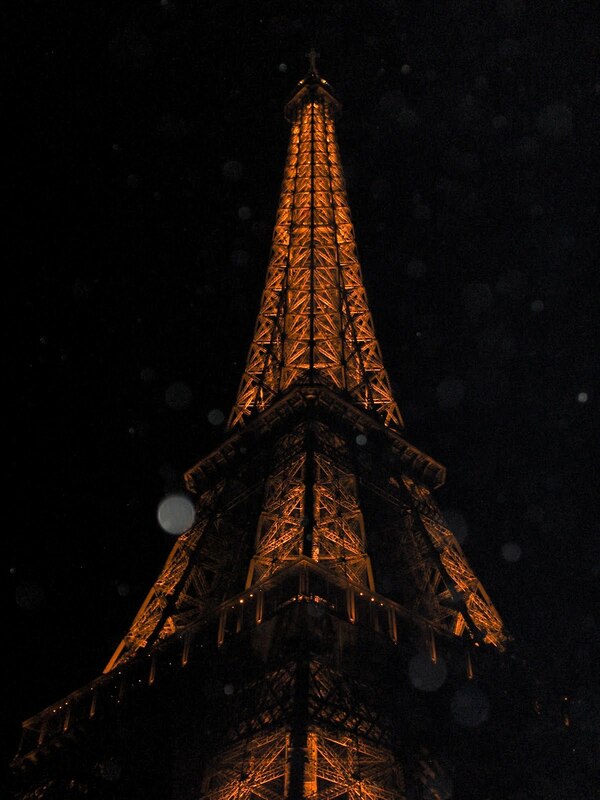 I hobbled my way through the Paris metro and back after tracking some pictures of the tower. It was certainly impressive, I knew it was big but its pictures don’t do it justice. I crashed in the softest bed I had been in for a long time and slept really well even though my legs were reminding me of the day’s mileage. I knew the ride out of Paris was going to be tough, I wasn’t expecting one of my worst days riding ever though. I grabbed an espresso in the hotel as I wanted to get away and get started so had some bread in my room with cheese that was left over from the day before. It was obvious a mile or so down the road that my legs were not going to behave for the day. There were a few steep hills to climb and my right leg was in real pain from the start. By lunchtime I was down to less that 10mph and every pedal stroke was agony. I had to keep stopping and trying to work the pain of my legs, I tried massaging it, laying down on the roadside for a bit, stretching. Nothing worked and I just had to cycle through it. I have never had such agony from cycling and really thought that I wouldn’t be going anywhere on my cycle tomorrow. I pushed on through the pain, determined to get to Chartres. The pain eased slightly for the last 20 or so miles. It was a shame as the weather was bright sunshine and the countryside, once out of Paris, was nice. 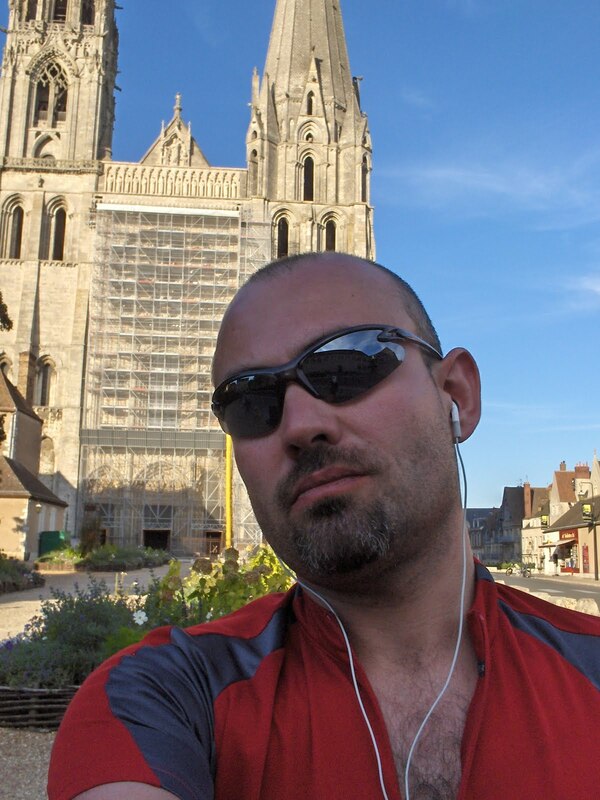 I was riding through small towns and villages which were quite picturesque and Chartres itself was nice, the Cathedral is right on top of a large hill and I even forced myself to climb up to it to have a look. I was glad to be at my destination for the day as there were some points when I wondered if I was going to make it and a train ride tomorrow looked like a real possibility. I had the same problem in Chartres that I had in Paris, I tried the F1 first and then 5 others and they were all full, what is it with Chartres I don’t know as Pete had the same problem when he was in the town. I finally found a lovely little hotel in Lace, just outside Chartres, I was glad as it was getting dark and I was shattered. The people that ran it spoke some English and I got the best meal of my trip in a Thai restaurant just down the road, where they also spoke some English and it was interesting have full cloves of garlic in my Thai curry. I had a good night’s sleep and the shower I had there was amazing. I had a nice breakfast of coffee, croissant and quark and set off at about 9. I didn’t know what to expect from my legs, after yesterday I was ready to jump on the train and go straight to Saint Malo. I was really stiff to start with and struggled on to lunchtime. I had my usual cheese sandwiches and crisps and then set off. I’m not sure why but I picked up massively and started rolling along quite well. Compared to yesterday when the day was just one massive struggle. It was the first evening that I had got into the town I was going to stay in and felt anything like alive. I found the F1 without too much bother and it was right next to a Carrefour. I grabbed some nice bread and a couple of cans of Kronenbourg and sat in my room watching a film on my laptop wondering if I would be able to smash out the 100+ miles I would have to do tomorrow in order to get to San Malo. 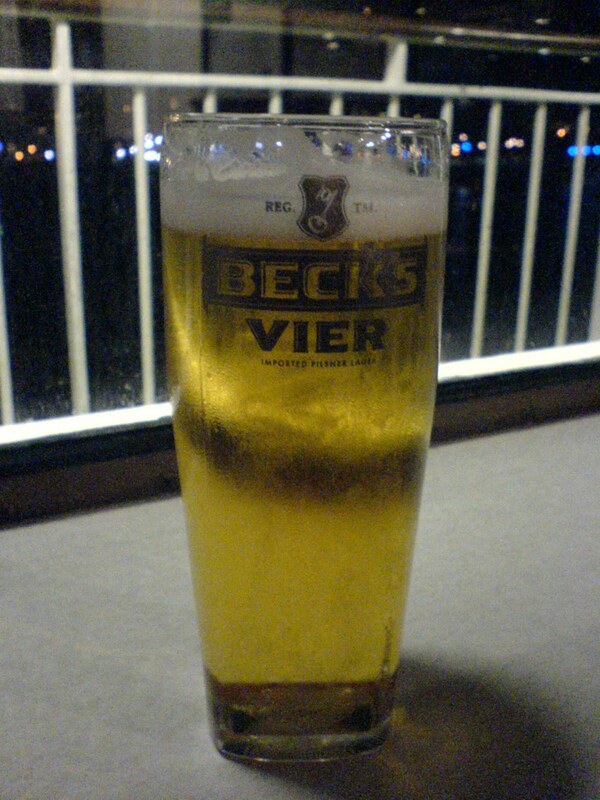 Compared to the day before when I was convinced I would be finishing off on the train. It was a surprise when I woke up and found myself getting ready for the long ride to Saint Malo, a surprise because I had not expected to get this far after I left Paris. It would be a long day although the weather started off as it had done since I had been in France: bright and sunny. I rolled through the countryside, making reasonable time considering how my legs had been around 12 I stopped and called Pete to have a chat, I had been singing to the cows as I rode along, as I had been using my iPod for most of the way, but the cows just glanced my way and got back to chewing the cud so conversation had been a bit sparse. As usual he checked where I was from the comfort of his desk. After I had eaten the usual bread, cheese, crisps and peanuts I got on with the rest of the ride. A couple of hours later the skies darkened and before I knew it I was riding through a full on thunderstorm, the sheet lightening was so close that there was no break between flash and thunder. 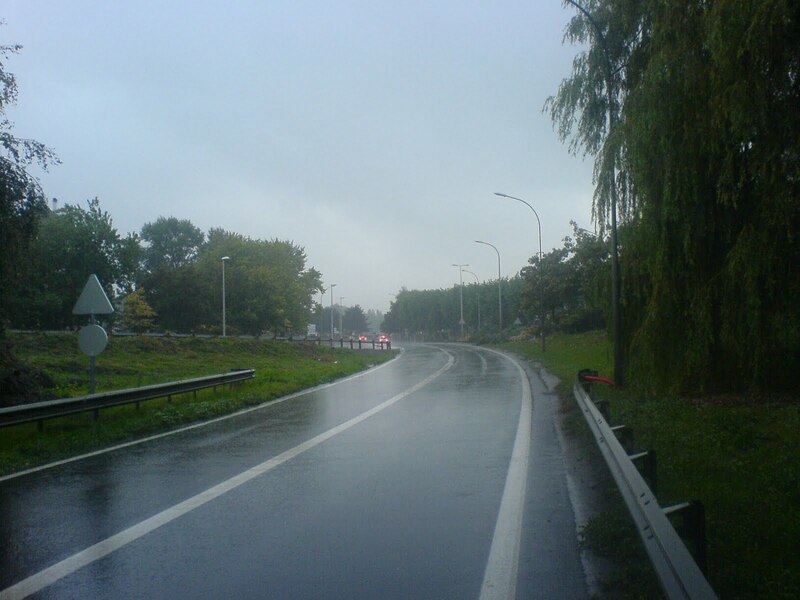 I hadn’t seen rain like this for a long time and it was more like a monsoon in Asia than a French Shower. I had quickly got my waterproof jacket on but had forgotten to take my bike computer off the bars, unfortunately it isn’t that waterproof and for the rest of the day I had to ride without it. The ride today had been like a lot of my time in France had been, gently rolling hills through farm land and small villages and towns. 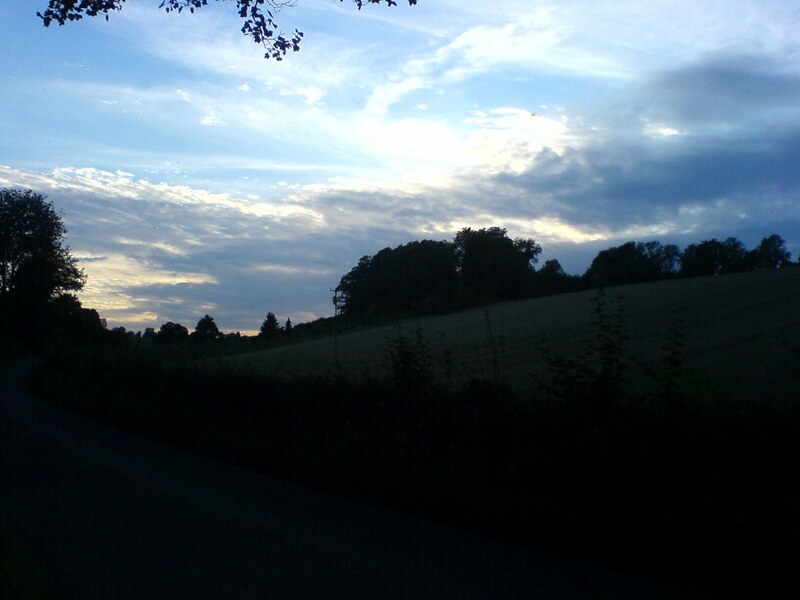 It was a good country to cycle through as the traffic that was about was fairly courteous and gave me plenty of space. I finally started to get close to Saint Malo at about 6 and started to relax a bit as I was into the last 20 miles or so. It was then my right leg decided to give up and cramp set in, the last 10KM to the hotel were really tough, with a lot of short stops at the side of the road to try and strecth it out, nothing seemed to work, I just needed to stop cycling. 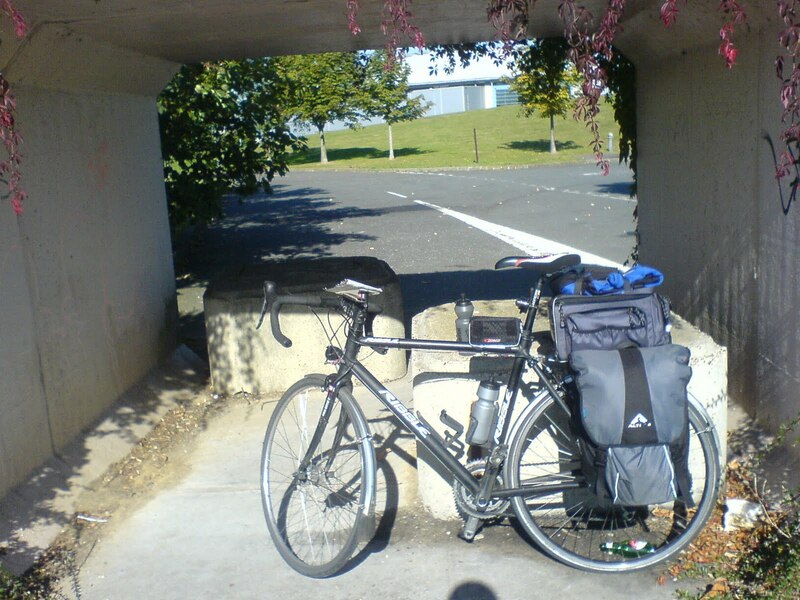 I finally got to the bit of dual carriageway that led into Saint Malo, it was dark and I was thankful that my lights were good as I limped and free-wheeled the last couple of miles, finally finding the Forumle 1 hotel tucked in a business park just off the dual carriageway at about 8:30pm. There were no restaurants around and I spent another night in my room with snacks and my laptop watching a film, enjoying just stretching out my legs. Despite all the pain and agony, no map to begin with, problems finding hotels and a thunderstorm I had made it to Paris and back on my own. 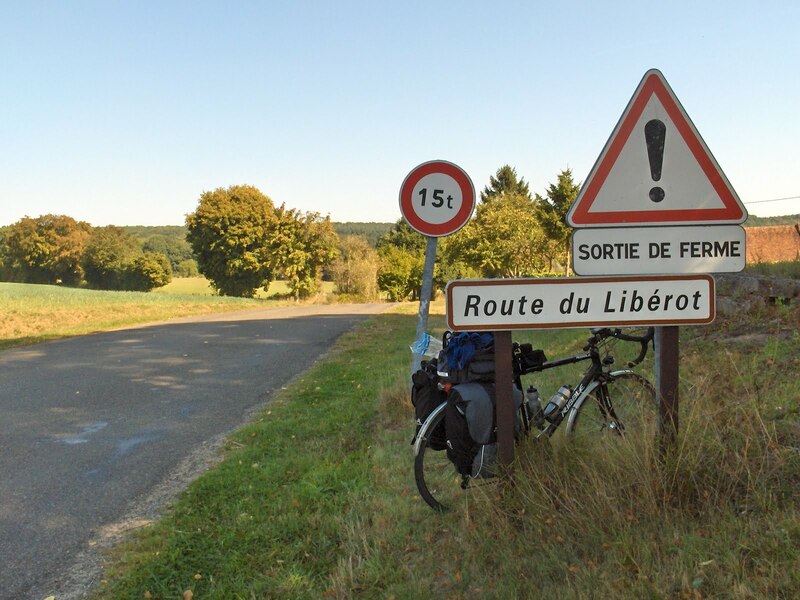 I had struggled through France, experiencing possibly my worst day’s cycling yet but I had pushed on and managed to cycle from Le Harve to Paris and back to Saint Malo, totalling over 500 miles in total. It had been a good ride overall, France is a great country and had surprised me just how rural if you weren’t in Paris. I had seen the Eiffel Tower and ridden on the Paris metro, I had seen the Palace at Versailles and the Cathedral at Chartres. I would loved to have seen more but I guess that’s always the case. Tired but satisfied I had gotten dressed in my jeans and T-shirt as the ferry was only 4 miles from the hotel. It was overcast when I left the hotel but wasn’t raining and I thought it would be fine for such a short distance…. so, drenched and tired, I rolled up to the ferry. By the time I got off the ferry at the other end it was later than I had expected, not wanting to get cramp on a dark country lane I opted for a train back to Reading, it also meant I got back several hours earlier. I promised myself that for next years ride, as there would be one, I would be much fitter.